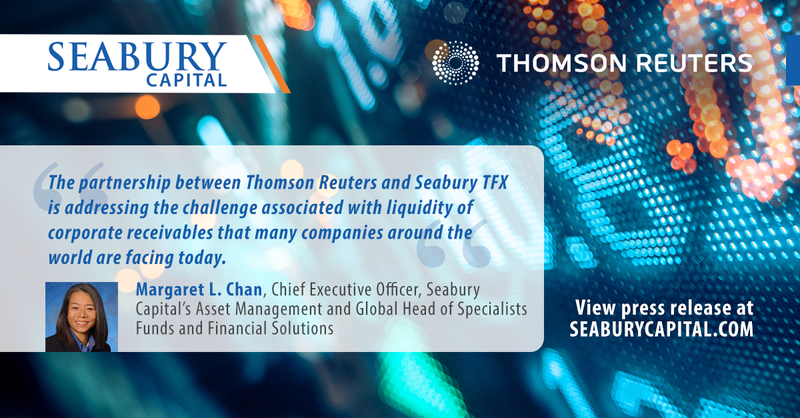 NEW YORK – September 17, 2018 – Seabury TFX (HK) Limited (“STFX”), a Hong Kong- and U.S.-based provider of trade finance solutions to supply chains around the world and a subsidiary of New York-based Seabury Capital Group LLC, announced today a new partnership with Thomson Reuters (NYSE: TRI) which aims to develop a new marketplace for trade finance in Asia. The first of its kind platform for trading of accounts receivable by institutional investors and corporate treasurers, the Receivables Board app will allow both primary and secondary trading, while developing a network of qualified corporates and investors. According to an Asian Development Bank survey*, there is a gap in global trade finance amounting to $1.6 trillion annually on untapped potential in trade, unrealized economic value, and lost opportunity. Treasurers need to manage working capital in a fast-changing market under an “expensive, high-risk low-return” financial world, while investors tend to look for “special niches” – instruments that could deliver adjusted return prospects, structure and risk.